ST. GEORGE — Plans for the development of part of St. George’s southern end east of Interstate 15 Exit 2 were further solidified by the city in a Nov. 2 City Council meeting. City officials approved an update to the city’s general plan in a portion of a 6,116-acre area of the region referred to as the “south block,” which covers the area extending from Fort Pierce Industrial Park at the north end to the Utah-Arizona border at the south, and from Interstate 15 at the west end to Fort Pierce Industrial Park area at the east. The area affected by the update falls in the eastern end of the south block designated as the 1,931-acre White Dome area. The amendment creates zoning changes that make way for low-, medium- and high-density housing and commercial and industrial developments. Originally approved in 2007, the south block land use plan proposed a mostly self-sufficient community with various residential neighborhoods, commercial, industrial and mixed-use areas. At that time, the plan was organized to accommodate approximately 43,000 residents and be developed over a span of approximately 30 years. The changes approved for the White Dome area encompass 1,188 acres previously designated as open space, park, residential and employment zones. With a mix of medium-to-low-density housing planned for the area, city planners say the update will encourage the development of more compact neighborhoods with parks and trails throughout the area. “The opportunity for a mix of lot sizes will promote more affordable housing choices. The alternative to this is spreading out more large-lot subdivisions in a sprawl-promoting manner which does not utilize land effectively nor encourage quality neighborhoods,” a planning commission agenda report on the topic states. Part of the amendment also proposes extending 3000 East through the White Dome area, where it will eventually connect with the proposed Exit 5 on the Southern Parkway. 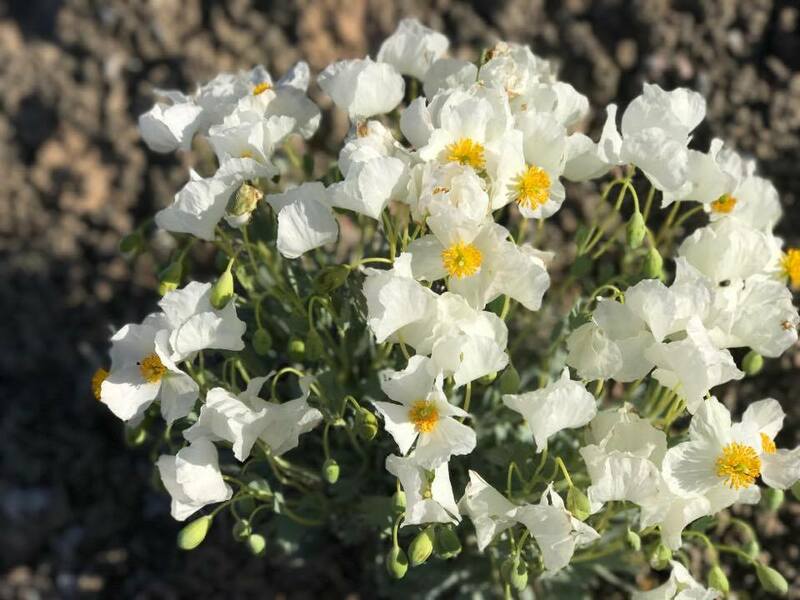 The newly rezoned area is directly adjacent to the White Dome Nature Preserve, 800 acres of open space that is home to two at-risk plant species, the dwarf bear claw poppy and the Siler pincushion cactus. The Nature Conservancy, the owner of the preserve, expressed support for the updated zoning in a letter to the city, while also asking that steps are taken to protect the rare plant species and their habitat. “I think the White Dome is a great asset to that area … so I think it’s great that they recognize that, and as development comes in with the plats, then we will address how they make the cuts in the slopes along where the development abuts up to the preserve,” St. George City Manager Gary Esplin said. Dust management techniques will also be utilized during construction to mitigate potential disturbance to the habitat, St. George Planning and Zoning Manager John Willis said. 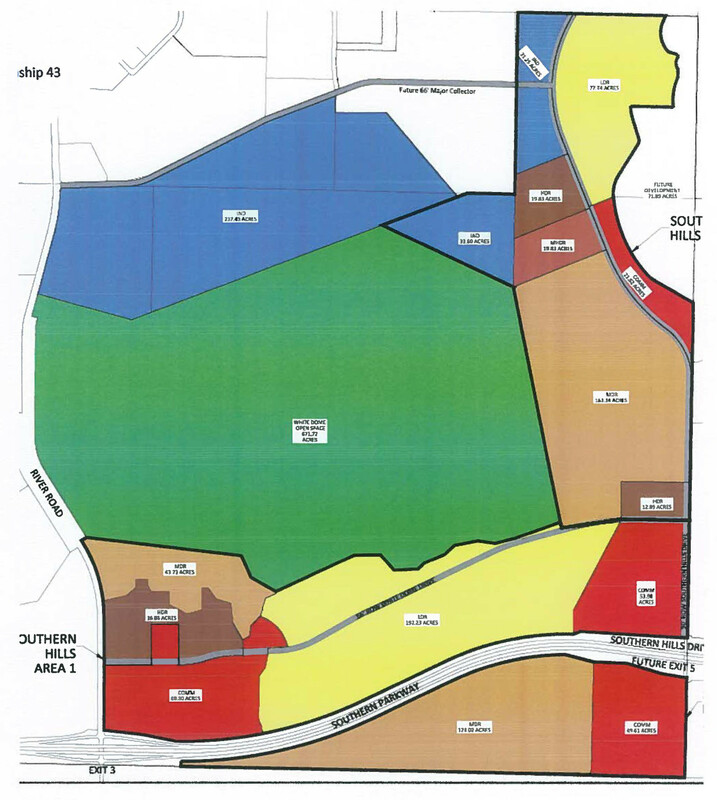 Another portion of the original land use plan was amended in June to make way for the 3,350-acre “Desert Color” project, which includes plans for a central commercial town center surrounded by resorts and residential neighborhoods, anticipated to support about 30,000 residents. Any construction projects in the south block are still likely years away from beginning, and each area is projected to be built incrementally over a period of several decades. Make sure the future residents here are warned about the sewer stench smell coming from the factories in Fort Pierce Industrial Park. Little Valley residents are already suffering from buyers remorse because that’s what they get to smell when the wind blows their way. If you have more information or find a separate odor incident, please email me or call me directly. Let’s talk about it. The factories were there long before most of the little valley residents. If you choose to live a couple hundred feet from Rock quarries, concrete plants and factories then you deserve what you get. And the beat goes on… When all that land is developed, what’s next, our Federal Public Lands? How many Brennans are out there in the wings waiting? Yes Joyce, this is the smell I was referring to in my original post. It might not be actual sewage, but it smells just as bad. It just makes me wonder if this is going to be an on-going problem, or if the problem will eventually be solved. Also, yes I agree with Scorch that the factories were there FIRST. That is why I stand by my original post! If you are going to build homes near this area, prospective buyers need to do their homework, and be aware of the proximity to these businesses, especially if one of them emits a foul odor. I don’t live near this area, BUT, I do drive by it often, and I have smelled the stench, it is undeniably AWEFUL!! !